Under 'Medicare-for-All,' patients would suffer, seniors would be shunned, hospitals would fail and health care workers would lose. Senator Bernie Sanders says that because Medicare is "the most popular, successful and cost-effective health insurance in the country" everyone should have it, regardless of age. But watch out for the bait and switch. Truth is, Sanders' "Medicare-for-All" legislation actually abolishes Medicare and Medicare Advantage, as well as employer-provided coverage, union plans and plans people buy for themselves. Every person, whether they want to or not, would be forced into a government-run system with the phony name "Medicare-for-All." The quality of your medical care would plummet. "Medicare-for-All" would plunge hospitals into financial distress, exposing patients to dangerous medical shortages, and forcing pay cuts on health care workers. But 16 Democratic senators, including New York's Kirsten Gillibrand, and 123 Democrats in the House, endorse the legislation. Have they actually read it? President Donald Trump warns that Sanders is "eliminating Medicare as a program for seniors." Trump cautions that "hospitals would be put out of business," patients would face "long wait lines," and seniors would "effectively be denied" care they need. Sanders calls Trump a liar. Fortunately, there's a way to determine who's telling the truth. The answer is in the 96 pages of Sanders' bill. 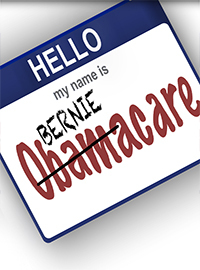 Four years after "Medicare-for-All" begins, all private insurance would be banned (Sec. 107), and Medicare and other government health programs would be terminated, just as Trump said. Everyone, including immigrants in this country illegally, would be enrolled in the new government program (Sec. 106). Newborns would be automatically enrolled at birth (Sec. 105). On paper, the new program guarantees hospital care, doctors' visits, even dental vision and long-term care, all paid by Uncle Sam. Here's the hitch. Hospitals would be forced to operate under conditions of extreme scarcity, with little revenue and more patients than ever. Right now, Medicare shortchanges hospitals, paying them less than the full cost of caring for seniors, but hospitals accept the low payments because they can shift the unmet costs on to younger patients who have private insurance that pays more. But in the new scheme, hospitals would be paid at Medicare rates for all their patients, not just seniors (Sec. 611). With everyone on "Medicare-for-All," no cost-shifting would be possible. The rates would be 40 percent less than what hospitals could get from private insurance plans. The severe short-changing would throw hospitals into crisis. Meanwhile, demand for care would surge, because it's free for all. Hospitals would have to jam more beds into rooms and corridors, skimp on nursing care and make patients wait. Sounds like the austerity in the British National Health Service. Only, in Britain, the public has an escape hatch. They're allowed to buy private coverage. That's not true under Sanders' "Medicare-for-All" (Sec. 107). Those alternatives are banned. You'll be trapped. The gold-plated union health plan or Medicare Advantage Plan you used to have would be a distant memory, as you wait in crowded clinics alongside people who never paid into Medicare or earned on-the-job coverage. In New York, the austerity would be magnified. Hospitals here have more debt and slimmer operating margins than elsewhere, making them less able to withstand cuts. Gary Fitzgerald of the Iroquois Healthcare Alliance warns that Sanders' bill would "devastate upstate hospitals." Doctors would also be paid 30 percent less than private insurance would pay them. To keep their doors open, they'll have to see more patients per hour. That's bad news for seniors, who take up more time. Doctors would avoid them like the plague. The Sanders' bill is a labor fiasco in the making. A staggering 1.2 million New Yorkers work in health care, more than in retail or manufacturing or any other industry. When hospitals are paid less, health care workers would get cut too. Under "Medicare-for-All," patients would suffer, seniors would be shunned, hospitals would fail and health care workers would lose. Who exactly is supposed to benefit, except the politicians?